Thank you for your interest in learning more about a newborn photo session. I offer a couple different options for your newborn session. A couple years ago I made the decision to stop the 3 hour long studio sessions for a few reasons. If you want this look of a studio backdrop and several cutes prop setups I can gladly recommend you to a talented friend of mine that does that. My family sessions can take place in your home or outdoors in warmer months and only take about 60-90 minutes. I focus more on snuggles, smooches, and natural moments with your new baby. I do also offer simple baby setups so you can still have beautiful images of just your little one. 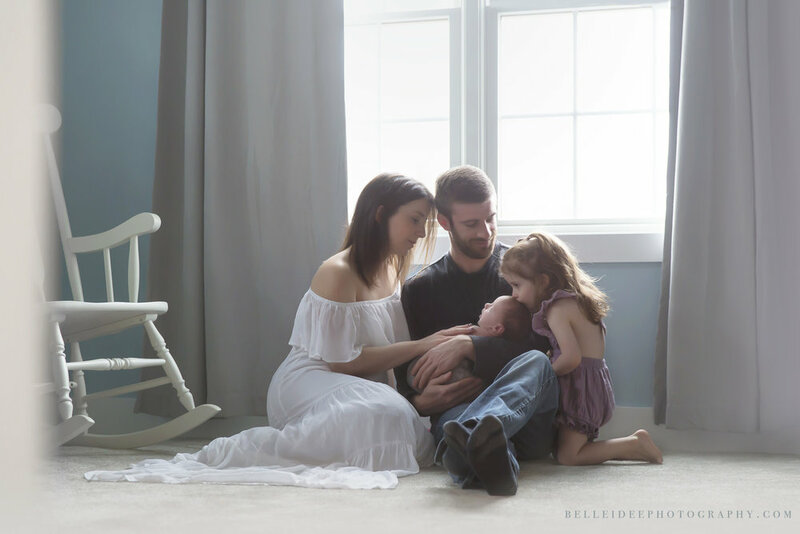 Family sessions typically last 60-90 minutes while a baby-only session is about 30 minutes. I prefer to schedule outdoor sessions either early morning after sunrise or late evening just before sunset. In-home sessions are best scheduled when the natural light in the room we will be using is the best or brightest. I can bring my lighting setup to your home if you prefer that for your baby-only setup, otherwise you may come to my studio. I will edit anything I love from your session and put those images into an online gallery. From those images you will select your favorites based on which package you select. - Use of props, headbands, etc.